Barnaby Wilde is the pen name of Tim Fisher. Tim was born in 1947 in Hertfordshire, United Kingdom, but grew up and was educated in the West Country. He graduated with a Physics degree in 1969 and worked in manufacturing and Quality Control for a multinational photographic company for 30 years before taking an early retirement to pursue other interests. 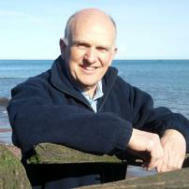 He has two grown up children and currently lives happily in Devon. Short Stories by Barnaby Wilde perfect for reading in your coffee break, in the bath, on the beach, or on the train to work. Gentle humour, a touch of sci fi, a hint of romance, an air of mystery, a smidgen of horror and a bit of adventure. How can stairs stop working? Is it possible to grow a man from a bean? Who is the monkey faced boy? What happens if you’re stalked by the invisible man? What if dragons were very small? Answers to all these questions and many, many more in Barnaby’s Shorts. Ten complete stories in every volume. Quirky Poems Poems full of old jokes and weak puns. Only suitable for those with a sense of the ridiculous. On themes as diverse as clockwork wellingtons and dodos, pausing on the way to reflect on ‘if elephants were very small’ and a tale about a dining table. Volumes 1,2,3 and 4 of Barnaby’s Shorts in one book. Forty coffee break sized stories in one place. for one price. (Click the book cover for more information). Thirty coffee break sized stories in each collection. Vols 1 - 9 of Barnaby’s Shorts in three volumes. These books are also available to borrow free via the Amazon Kindle Owners Lending Library. (click here for more info) Available in print and e-book editions. Comic novels by Barnaby Wilde. A chase through time as two men’s lives become inextricably linked when their time lines get entangled.